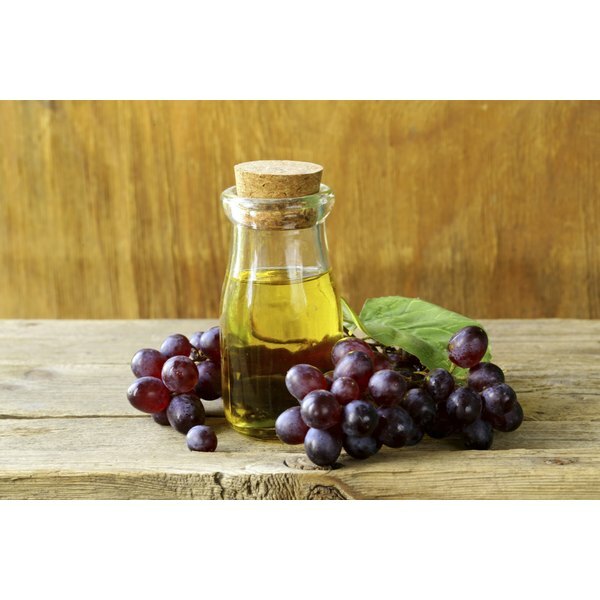 Grapeseed oil works well with most recipes that normally include vegetable oil. While vegetable oil is made from a blend of oils, grapeseed oil is made only from grapes; both oils have high smoke points, meaning that you can heat them to high temperatures before they burn. Both oils are also good sources of polyunsaturated fat, which may help lower cholesterol levels and may help protect you from cardiovascular disease, according to the American Heart Association. Use grapeseed oil in salad dressings, marinades or stir-fries, or drizzle it on sandwiches along with a sprinkling of balsamic vinegar. This oil is also suitable for deep-frying, according to the U.S. Department of Agriculture, so you may use it for french fries or onion rings. Before going overboard, however, consider that grapeseed oil is pure fat and contains a hefty 120 calories per tablespoon. Consuming too many calories will lead to weight gain, so limit fried foods and use only a teaspoon of grapeseed oil -- which contains only 40 calories -- when sauteing.